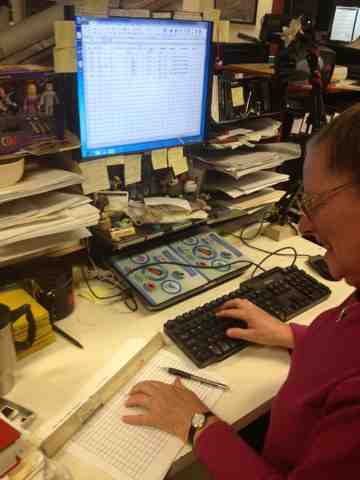 Volunteer Patty Tuller data enters lab analysis data from paper forms in the clean area of the Fur Store Archaeology Laboratory. While lap top computers have streamlined this step in some of our lab situations, the use of volunteers and the sometimes dusty conditions in the "dirty lab" makes direct digital recording using laptops difficult. After the field school, we hope to continue to use the weatherized IPads for routine collections labeling processes and direct analysis recording. Labels: Data entry the old fashioned way.